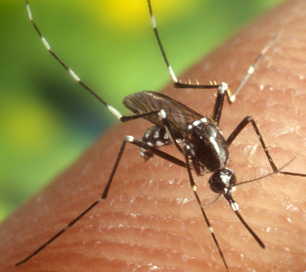 Temephos is used primarily to control mosquitos in non-potable waters. Temephos is an insecticide primarily used as a larvicide to control mosquitoes in swamps, marshes, lakes, shallow ponds and other non-potable waters. Human exposure is expected to be low due to its short half-life, but the World Health Organization reports that it may end up in drinking water when applied to water storage containers. According to the EPA, temephos can affect the human nervous system by inhibiting cholinesterase, causing symptoms of dizziness, confusion and nausea, and potential respiratory paralysis or death with exposure to large amounts. In a study in human male volunteers who were prisoners, 10 men were given temephos at a dose of 1.1 mg/kg body weight per day for 4 weeks, and 9 men took temephos at a dose of 4.27 mg/kg body weight per day for 5 days. There was no inhibition of cholinesterase activity in the plasma or in erythrocytes.